Notice: Bob Meyer, the founder, editor & publisher of BarterNews Magazine has retired after 35 years. But his seminal programs, "FastStart To Barter" Programs I and II are still available. Are you a new barter company? Or have you moved recently? Get listed on our heavily-trafficked web site. Get immediate access to 800 of the Most Important Barter Contacts in the World! Place a link to BarterNews on your website! - Click here for instructions. 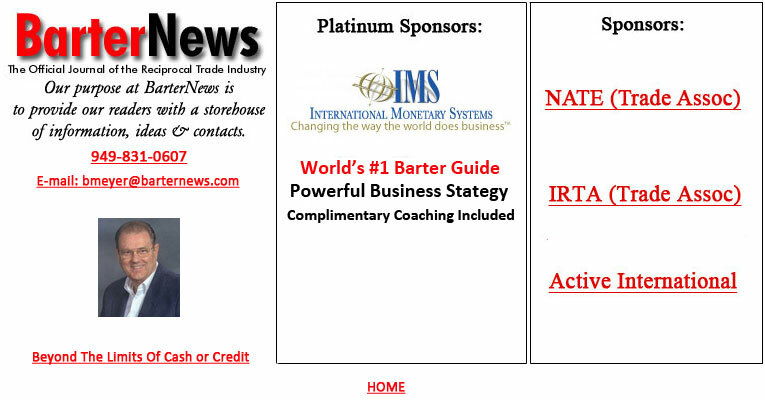 BarterNews is published quarterly by BarterNews 2017©. All rights reserved.